Less than 48 hours of being on the ground from my Delta flight from Minneapolis, it’s back to India with a nice packed trip. I’m sure you can see in the preview above that this is a pretty packed trip regarding flights, terminals, and products to review. Now the whole idea of flying Emirates was that (it was one of the cheapest) I wanted to show you how things have changed with the electronics ban in place, and how the process goes should you choose to carry on your larger electronic devices to the gate. However, the electronics ban was lifted from flights from Dubai to the United States, so the best purpose to be served with the Emirates flights are to show you how the security process has changed at Dubai Airport for US bound flights. I would imagine it’s something similar to the Abu Dhabi Terminal 3 Pre-Clearance Facility for the US bound flights but I can only speculate right now. Onto the flights. 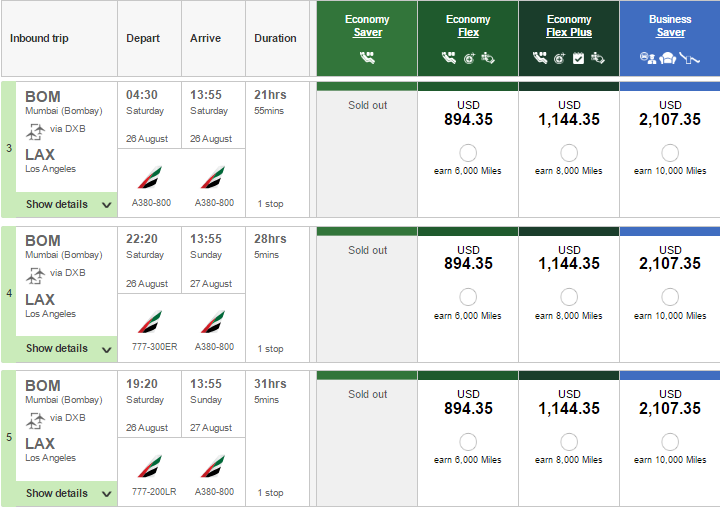 Flights were very cheap on Emirates as I said. Here was the outbound price when choosing a roundtrip. It is important to note that that low of an Economy Saver fare will only be available if you choose to book a roundtrip. If you book one way, then the price rises to somewhere near $900. So I chose the Economy Saver fare. That’s $452 outbound leg. On this leg, I wanted to do a full review ofLAX’s redone Tom Bradley International Terminal. But I due to unexpected last minute commitments back at home, I arrived at the airport so late that I only had time to go to the gate directly. I’ve flown through it many times after it was redone on my blog on my flight to London with British Airways back in 2014, my flight to Abu Dhabi on Etihad last year, and several other times in premium cabin which I omit reviewing on the blog. However, I’ve never formally reviewed it to show all, or most, of what can be found inside it. But I guess that will have to wait until next year. After flying to Dubai, I’ll have a 2.5-hour layover there, then off to Mumbai. I have some internal flights within India, but I’ll talk about those later. For the return journey, it gets a little pricier. Typically on these international airlines, saver fares disappear quickly when booking out of the main hub which is alright, because even though you pay a little more, you get more perks. 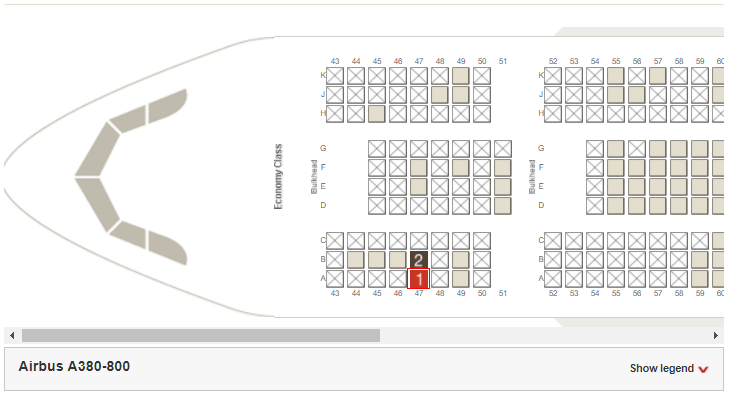 For example, on the saver fare, you don’t get complimentary seat selection anymore with Emirates. So I had to spend about $80 in total for me and my relative on the outbound journey for both flights to ensure that I got a window seat and he sat right next to me. Take that into consideration should you choose to fly Emirates. I originally opted for the itinerary that yields a 2.5-hour halt on the way back, but that was more expensive. So I chose the 9-hour layover one. But this is a blessing in disguise. This is great because I can review Emirates’s 777-300ER economy from Mumbai to Dubai rather than fly their A380 for the 4th time on the same trip. Also with 9 hours in Dubai, I can properly review the massive terminal 3 which is home to Emirates. That review will be a very, very long post, but it will be an informative one I hope. Then back to LAX on Emirates A380. So, in the end, I chose option #4 (The option numbers are written in the green box to the left of the route name). Now since this was a paid journey, I had to credit the miles somewhere. Emirate’s Skywards program has no value to me. So I decided to credit the miles to my favorite frequent flyer program, and quite possibly the best one out there: Alaska MileagePlan. An added bonus was that during the time I booked this, MileagePlan held a promotion where the miles earned on certain routes with partner airline in economy class earned double miles. As of the time of this post, the promotion should still be there. So if you are traveling on any of Alaska’s partners in economy on eligible routes, I would take advantage of this as MileagePlan miles are some of the most valuable frequent flyer miles of all the airlines in the world. So for my flights from Los Angeles to Dubai, and Dubai to Los Angeles, I earn double miles which I am very happy about. So the price for the return fare was $794.45. The price appears to have gone up by about $100 from that time that I booked it. Now I also booked some internal flights while in India. 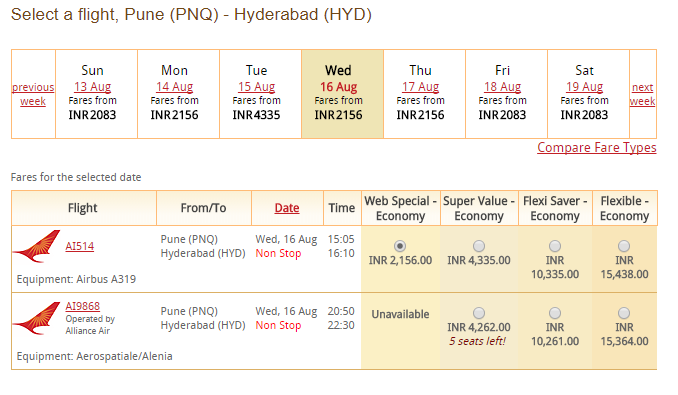 While I would arrive into India with Emirates, I would take a car to my hometown Pune and depart from there to Hyderabad. 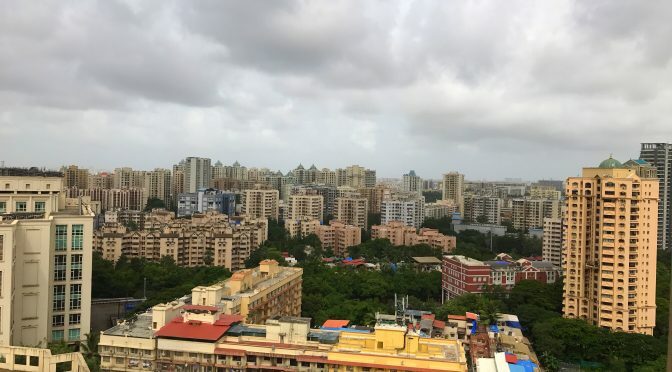 I flew out of Pune once before on the blog with Jet Airways to Abu Dhabi last year. As I said, Rs. 10903/- is about $169 so that’s not bad. Both of these flights were being operated by Air India’s A319 aircraft. Also, I tried looking up some Air India domestic business class photos but there were none so hopefully this review and flight would give a good overview to passengers. Originally, I would have chosen to review Jet Airway’s Premier class on the same route since it is much better, but a couple things influenced that decision. I suppose there are a lot of reviews on Jet Airways premier class but not many on AI’s domestic business class so this would be useful in that aspect as well. So anyways I am crediting the miles from this flight to my United MileagePlus account since both airlines are Star Alliance. 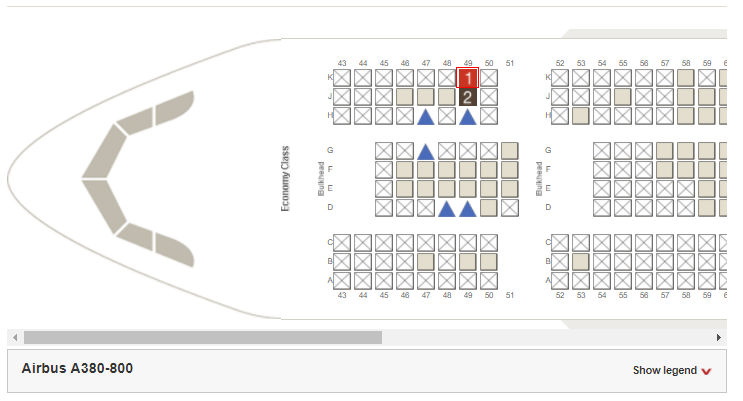 I chose seat 47A and 47B for my relative. I prefer the right side of the plane usually but I know from numerous flights to the east that sitting on the left side departing out of LAX gives some unreal sunset views. Going to Dubai, you get sunset and sunrise, but you won’t get the sunset just before arriving in Dubai, otherwise, the left side is the best side to sit on for these flights. Also on Emirates, their entire main deck is dedicated to economy class. 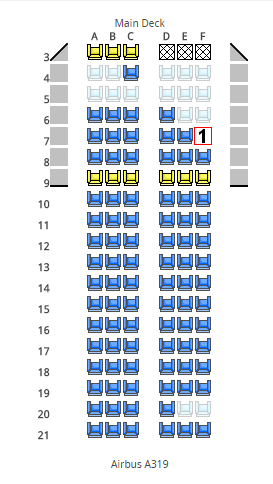 So I also tried to find a seat at the front of the aircraft. Sitting at the very front is where the cabin will be the quietest. Essentially you will get the beautiful engine buzz during takeoff and climb, but as you climb higher and higher, the winds get stronger and that’s all the noise you’ll hear from the front of the plane. It’s always a lovely sound to hear. Now, this flight will happen in pure darkness. 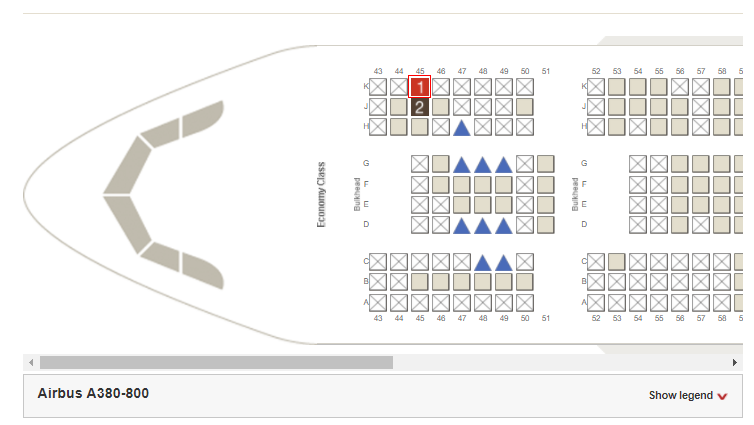 So I just picked a seat at the front of the aircraft, but on the right side. Plain and simple. Our seats were 49J and 49K. I wanted to be as close to the front as possible so I just went with 7F here. Air India’s economy class should make an interesting review. I have not seen any reviews of Air India’s domestic business class product so I’m hoping this will provide an interesting review of what that’s like. Now, this flight was on Emirate’s 777 product, which is a little outdated compared to the A380’s economy product. Now EK has retrofitted many of their 777-300ERs to the new economy, but for the sake of variety, I hope I get an aircraft with the old economy product. 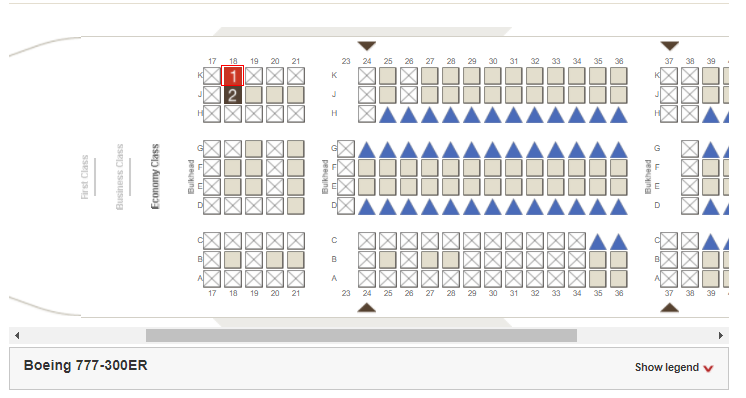 Ideally, the last 5 rows of the aircraft are in a 2-4-2 configuration so my relative and I could have sat together and just us two, but I wanted to sit closer to the lovely GE-90 engines that EK’s 77Ws have. So I chose seats 18K and 18J for us. This flight was also entirely a flight in the dark, so the side of the aircraft did not matter and so I simply went with the right side. And to cap off my summer flights for this year, I finished with seats 45J and 45K at the front of the aircraft. Because it is summer and this flight would be traveled through the tip tops of the northern hemisphere, this flight would take place exclusively during the day. Nothing too much else to be said there. This may seem a little peculiar, but let me explain. My itinerary here includes flights through Pune Airport which is a Military airport, or as India like to call it, a “defense aerodrome”. Photography and video filming are very restricted at these Defense/passenger airports, or so they want you to think. I made a video of my flight from Pune to Abu Dhabi on Jet Airways last year and many people have asked me how I was able to film inside Pune airport, so I’ll have a post dedicated to explaining the legality of filming in Airports in India since it is a pretty gray area that many people cannot seem to find the solution. So I hope you guys will enjoy this series of new airline trip reports. Thanks for reading and do be sure to check back soon for the rest of the trip and subscribe if you haven’t already to get notified of new posts! There’s more to come in the coming days.